so its lies unused, forlorn olive trees uncared for. Can reach their citadels with ease and army protection. 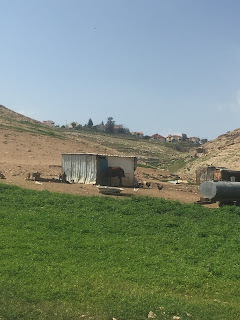 Hebron has been a site of conflict for many decades and the way it has been divided by the Israeli military and settlers was perhaps one of the most shocking things we saw all week. To understand some of the background to Hebron being a site of extreme tension and conflict we need to go back to 1994. In that year an Israeli settler Baruch Goldstein entered the Ibrahimi Mosque in Hebron, the site of the tombs of Abraham and his wife Sarah, and killed 29 Palestinian worshippers and wounded 125 others with an automatic assault rifle. He was killed on the spot by survivors. While the Israeli Government condemned the massacre and made illegal Baruch's extreme Kach movement, they refused demands for all settlers to be disarmed and for an international force to protect Palestinians. In response to Palestinian demonstrations, the Government closed certain Hebron streets to Palestinians allowing only settlers into them, resulting in Palestinians business being closed. I have heard a lot about IDs and what they mean but the more I hear the more confused I get. I will try here to work through what I think is correct. There are four categories of Palestinian IDs issued by the Israelis: Gaza, West Bank, Jerusalem and Israel. With each come different restrictions on travel and rights of residence. A Palestinian with a West Bank ID can get permission to travel to Jerusalem, but getting the permission is not easy and nor is the journey - see “The machinery of oppression” below. As far as I can understand travelling to Israel is very, very much more difficult and travelling to Gaza impossible. Palestinians with Israeli IDs have greater freedom to travel but may not legally reside in East Jerusalem or West Bank. Those with a Gaza ID are not allowed to travel into Israel or to Jerusalem or West Bank except under extraordinary circumstance. It is extremely difficult to get permission to reside in an area which is not your ID. I wrote before about Bedouin villages being considered “unofficial” and subject to summary demolition. In East Jerusalem the house next to the Al Saraya Center for Community Services was confiscated by the Israelis. A family moved in and built an “unofficial” extension which included bricking up a window in the Saraya building. Saraya went to court. The Israeli court agreed the extension was built illegally but gave the Israeli family six months to get the appropriate legal permission, which they succeeded in doing. Saraya is now using its bricked up window as a bookcase. Meanwhile, Bedouin villages in the West Bank are on daily alert for the arrival of the military demolition squad. To get from the West Bank to Jerusalem everyone (except the Israeli settlers) must go through a check point. So we might understand something of the every day experience for Palestinians we were sent through a pedestrian checkpoint. Wadi Abu Hindi is a Bedouin village of some 150 families living in around 50 metal houses paid for by the EU. You might think that a static Bedouin village is an oxymoron as Bedouin, by definition, are nomadic herders moving through pastures as the seasons change. Prior to 1948 that’s how they lived. Bedouins travelled with their herds, crossing countries and borders. After 1948 previous grazing lands now designated as Israel were closed to them, these included the coastal area, Galilee and the Negev, but nomadic herding was still possible on both sides of the Jordan river. After 1967 significant areas of the West Bank were designated military zones and became closed, as did the border between the west and east banks of the river. This forced Bedouin into static villages.